← Waiting for the Light to change. If you are trying to improve your photography skills then you have to always carry the gear. Last night, while walking on the Boston water front, down by the ICA, a private party was just getting started. It was dark when the Rolls Royce and several other incredibly high-end vehicles started arriving. My Canon G15 is a beautiful, small, and lightweight camera. Coupled with my Manfrotto monopod any night shot is possible (except on bridges where there is constant vibration you will need a tripod). Last night I was carrying only the camera when I walked past the intense security at the venue to get this shot of the Rolls Royce with the Boston skyline. I have to admit I was a little nervous. I have never seen so much security for a party in NYC or Boston, only at the White House in DC. The guards were wearing earphones and wires and I have no idea who the guests were. I heard very little English and saw only black ties. The wait staff and the bouncers were incredibly rude, so my husband’s technique to distract them and ask what was going on enabled me to get off one shot before being asked to leave. My regret was not being prepared. I am like a hound dog- I could see from a distance those cars arriving and I knew there would be a picture somewhere at the scene. If I had my monopod I know I could have taken this shot with total sharpness from the Rolls to the skyline buildings. 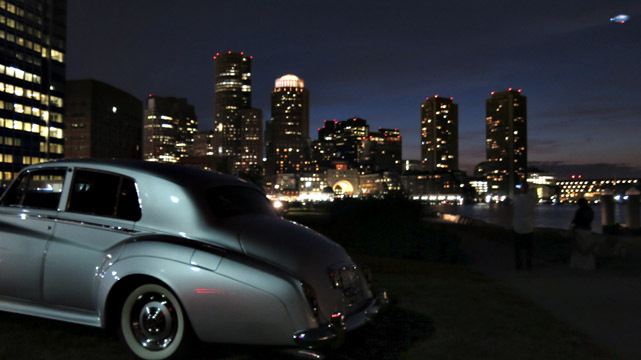 This entry was posted in Boston by Night, People and Places, revisiting and tagged Boston, camera, Canon G15, monopod, night photography, party, Rolls Royce, security, skyline, water front. Bookmark the permalink.